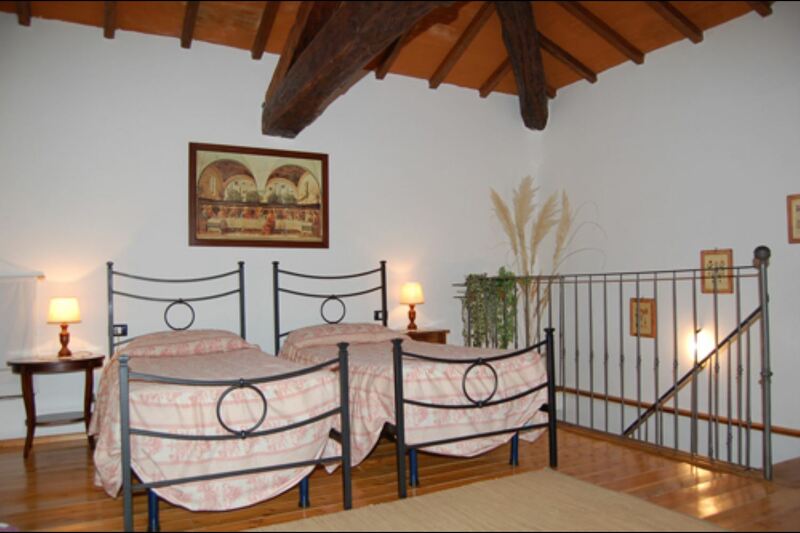 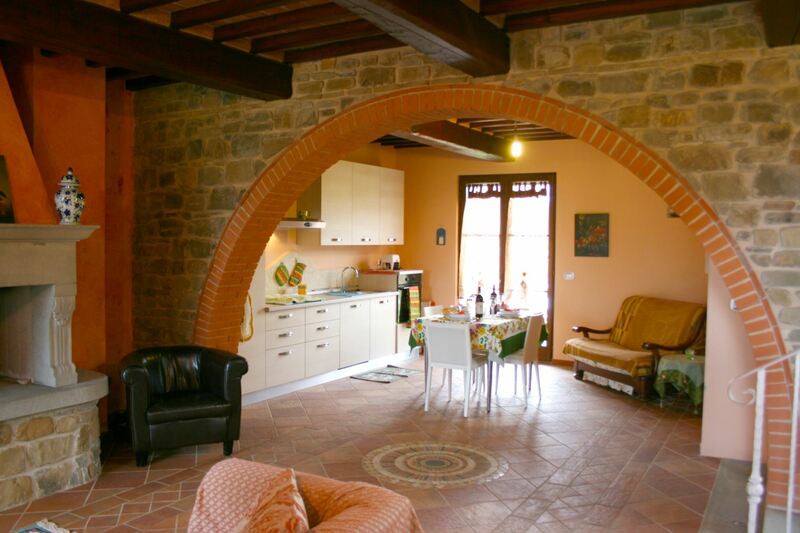 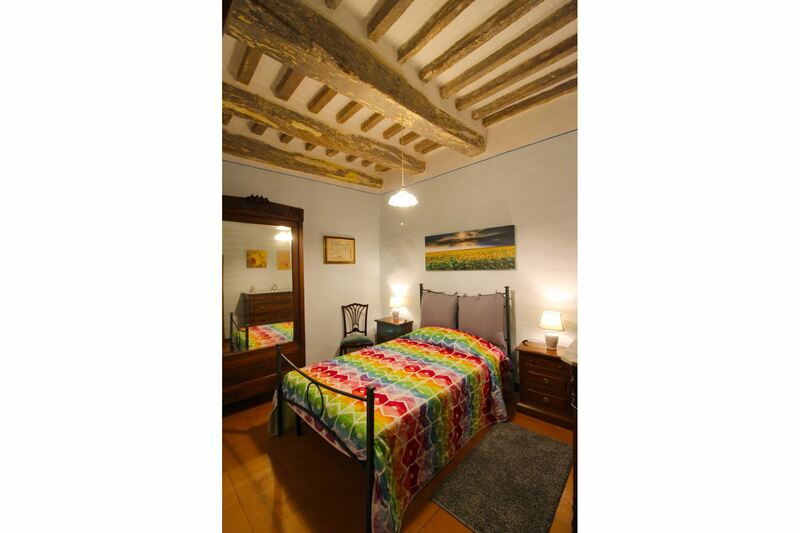 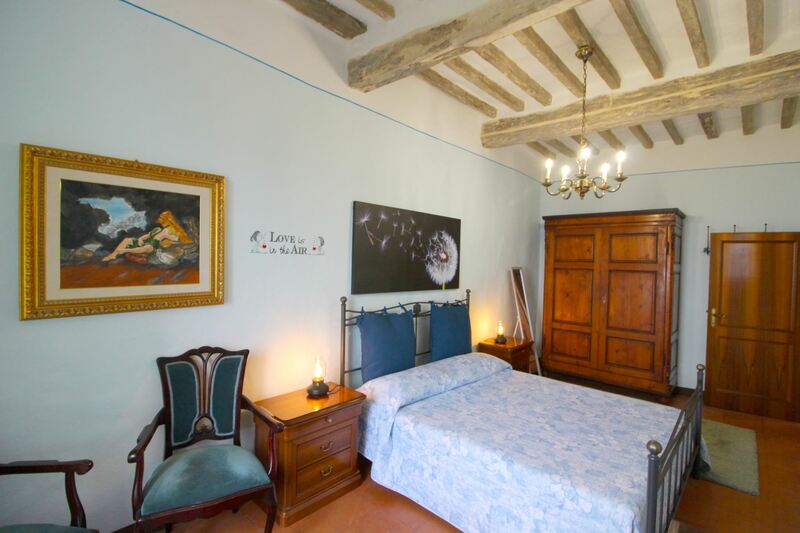 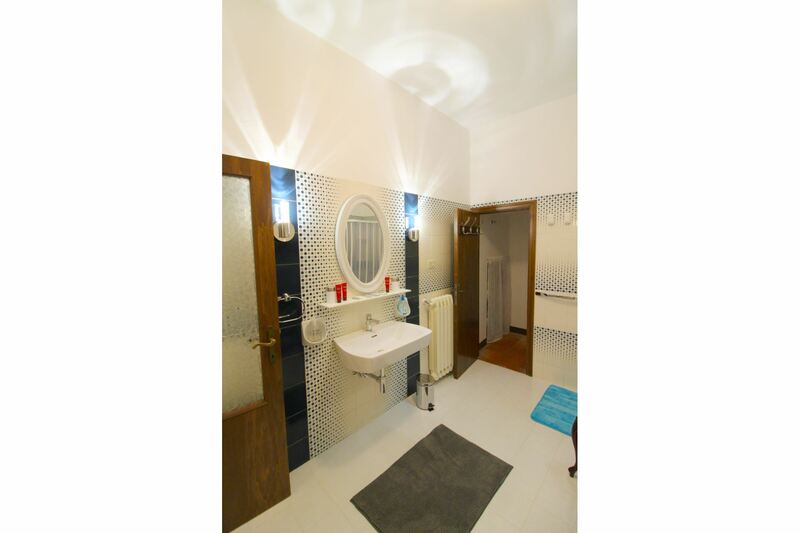 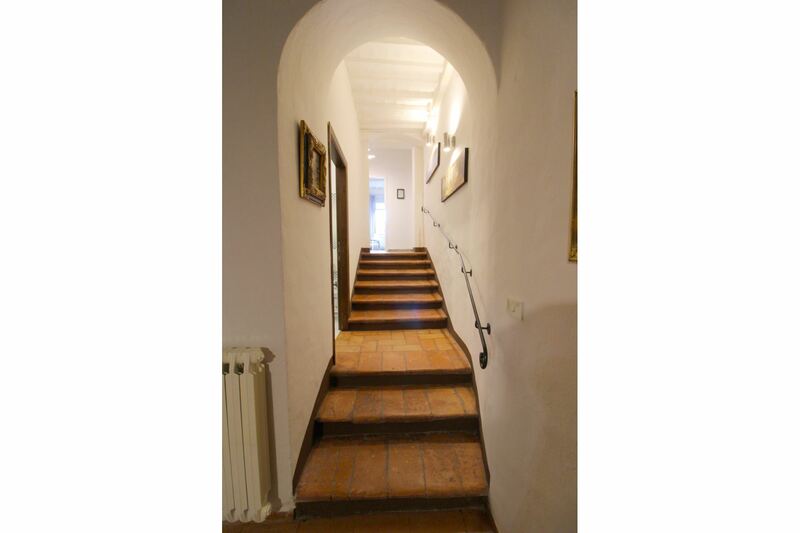 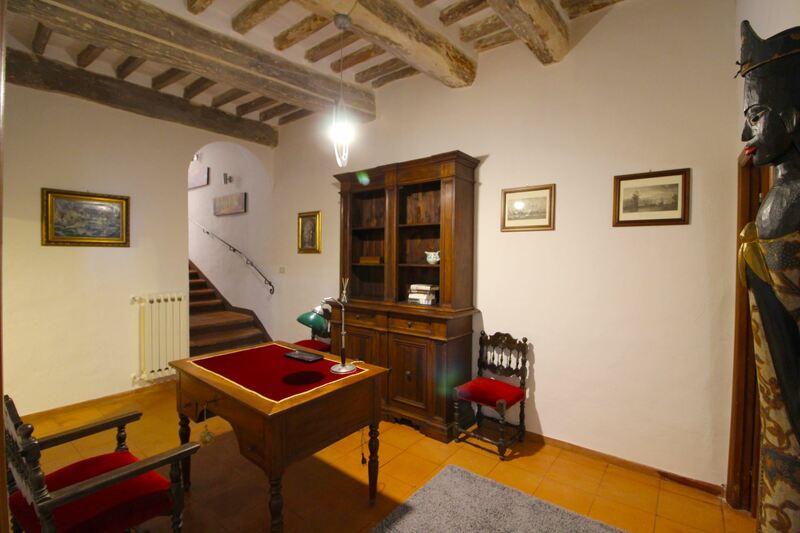 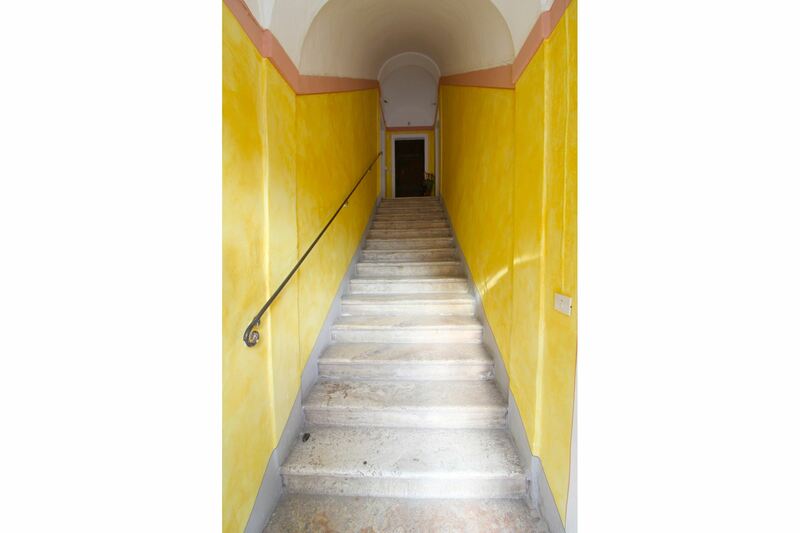 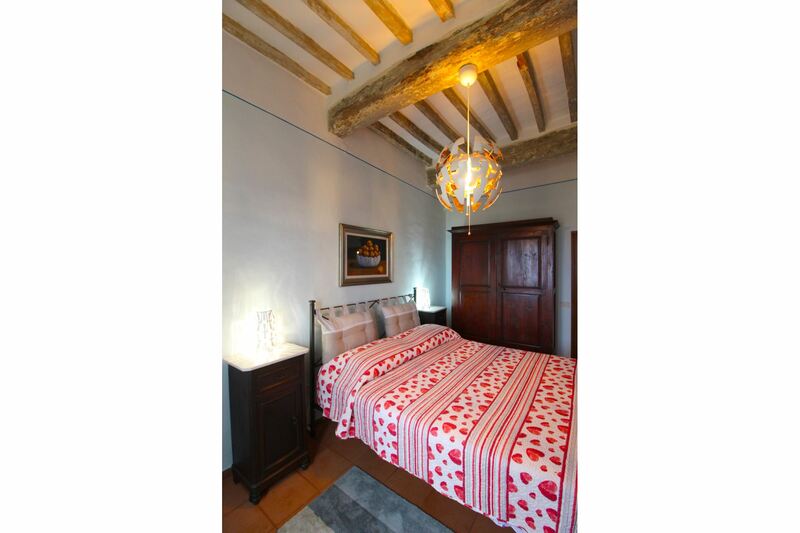 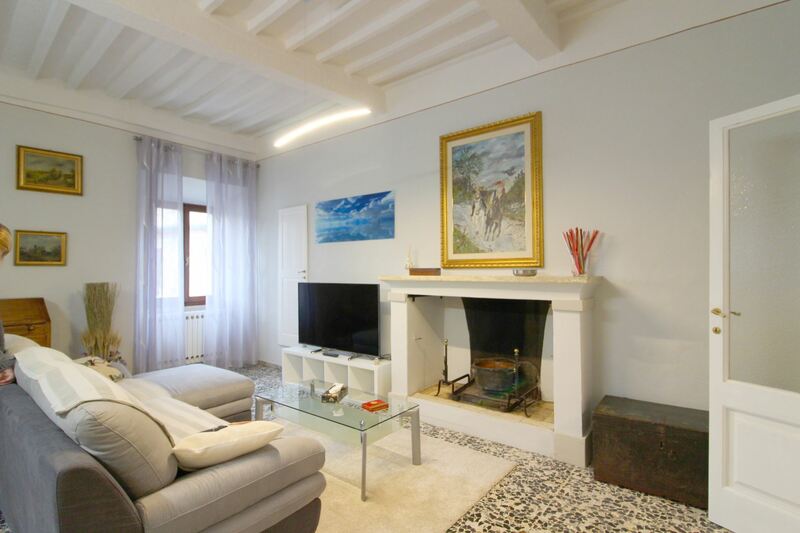 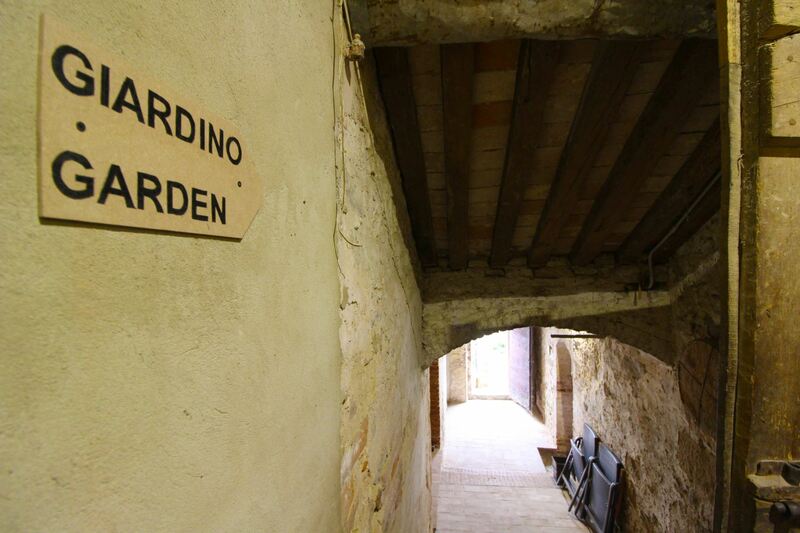 Apartment in the center of Montefollonico, Valdorcia, Tuscany, sleeps 5. 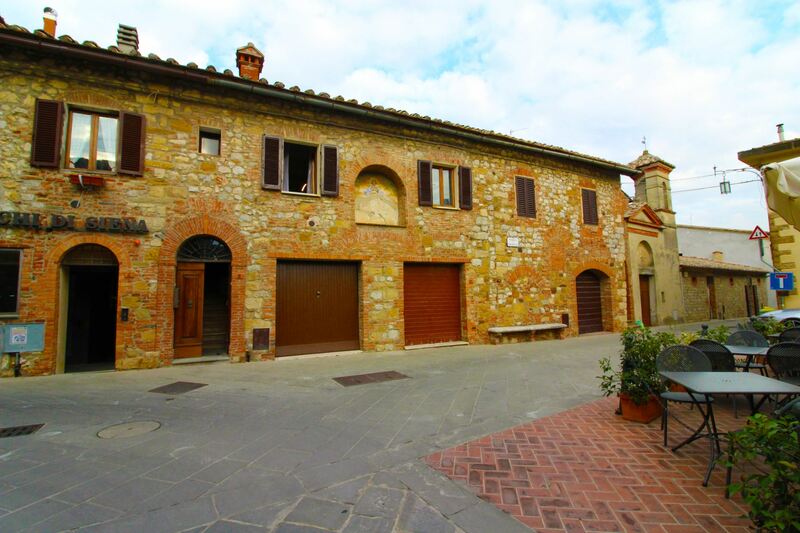 An ancient building in the old town Montefollonico. 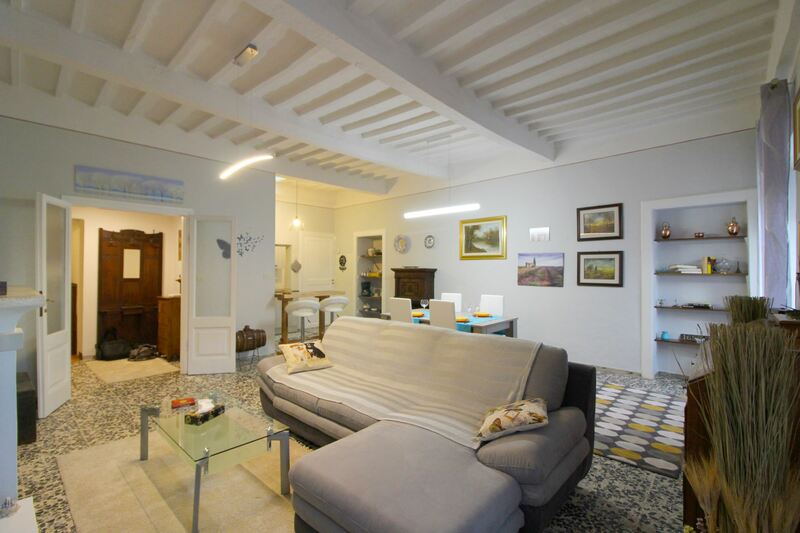 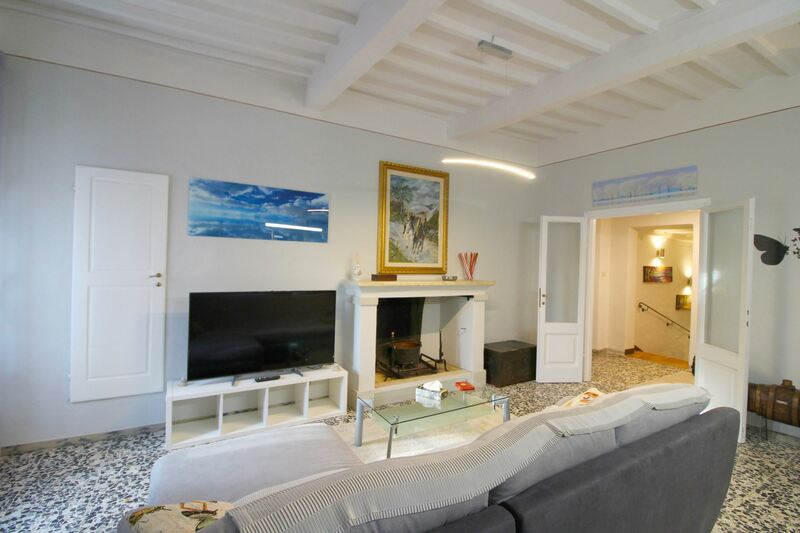 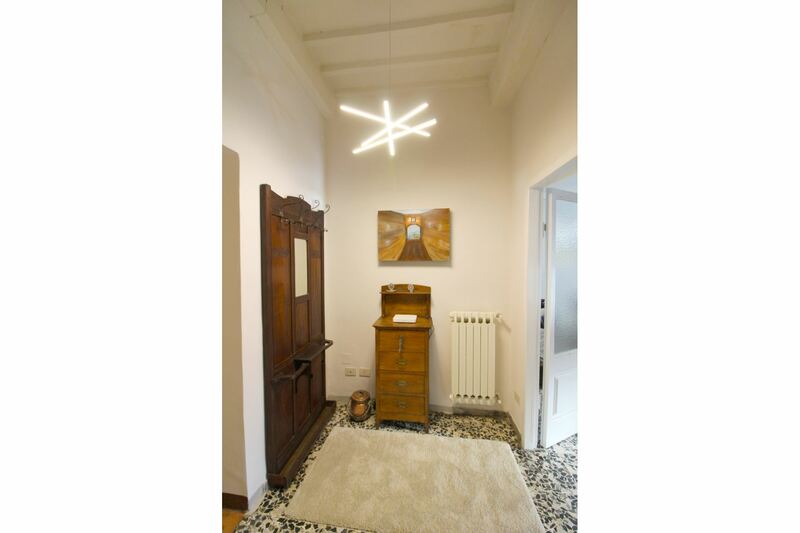 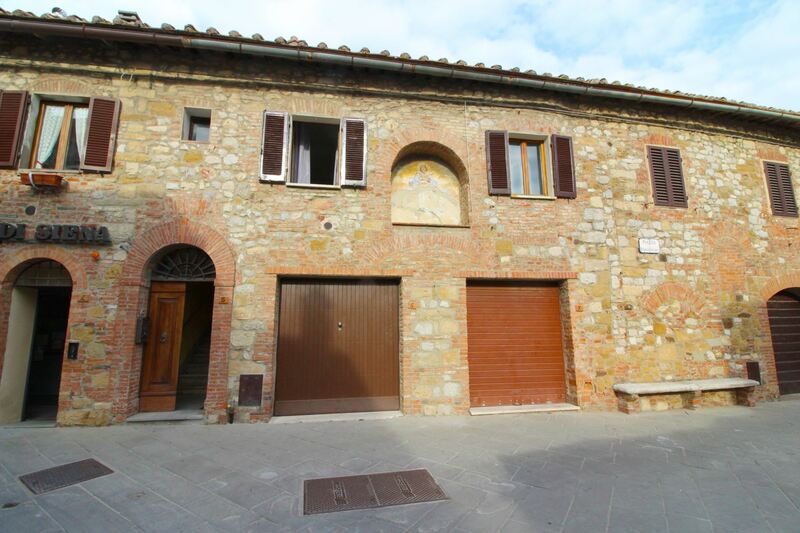 Wide and bright first floor apartment on an ancient building in the historical centre of the small village of Montefollonico, in Valdorcia valley. 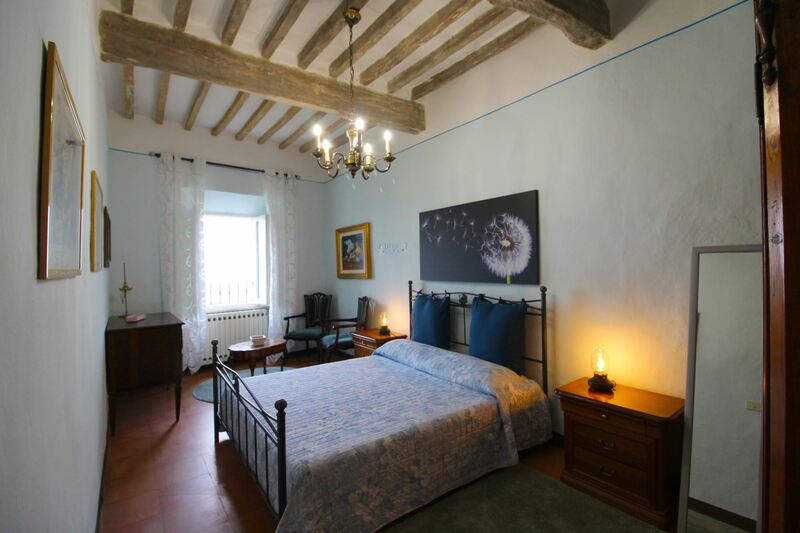 The building dates back to 1200 and was seat of a “Fraternita”, a place, which during periods of plague and famine, served as a shelter for the neediest by being connected to the still existing Chiesa della Compagnia. 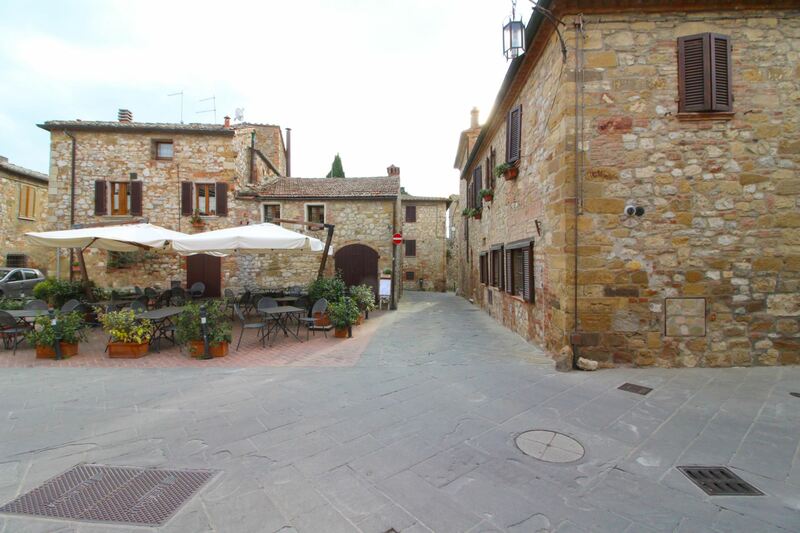 Montefollonico, a medieval village. 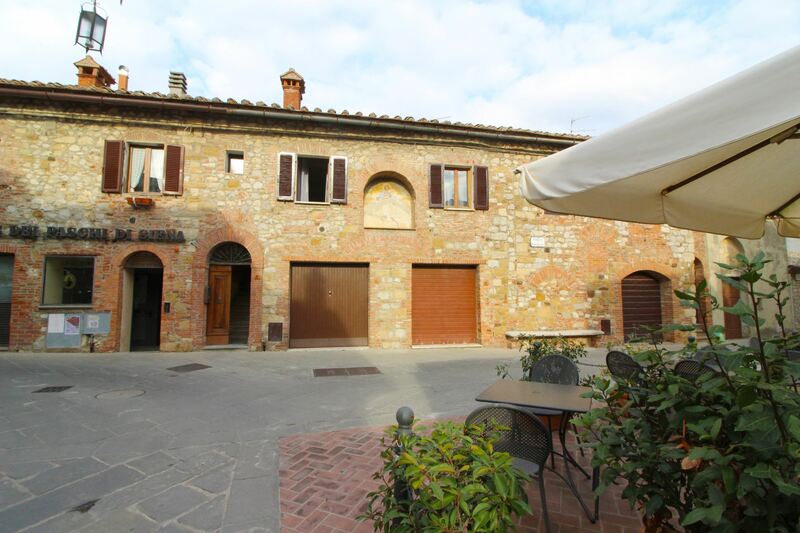 Montefollonico, at about 575 meters above sea level, is a small village of medieval origins which still preserves its peculiarities and is still characterized by small lanes, ancient walls, entrance gates and towers. 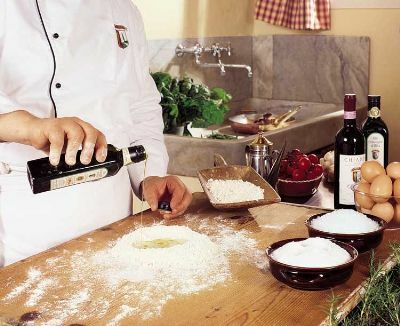 In the village there are all the basic services, such as restaurants, cafes and a small grocery shop. 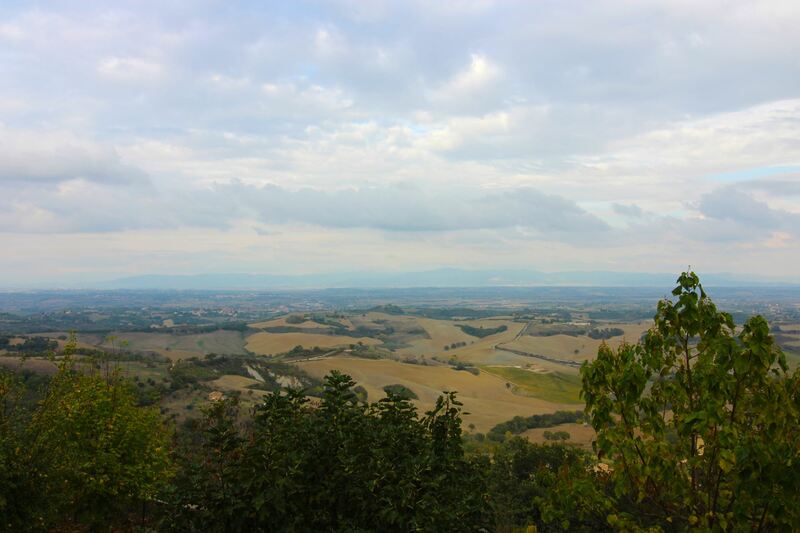 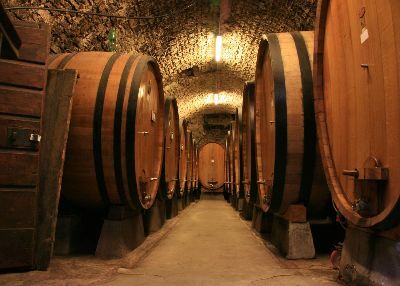 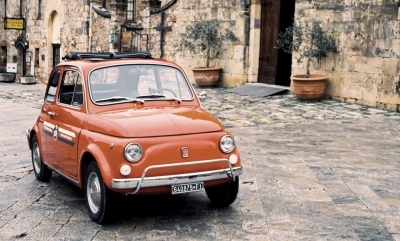 Its position is strategic to visit Tuscany and the whole Valdorcia, a few km far we find Montepulciano, Pienza, San Quirico. 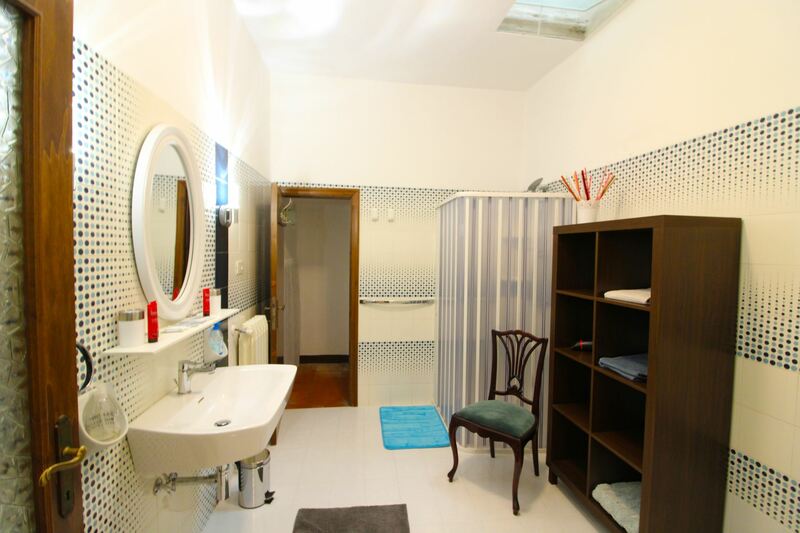 Apartment facilities. 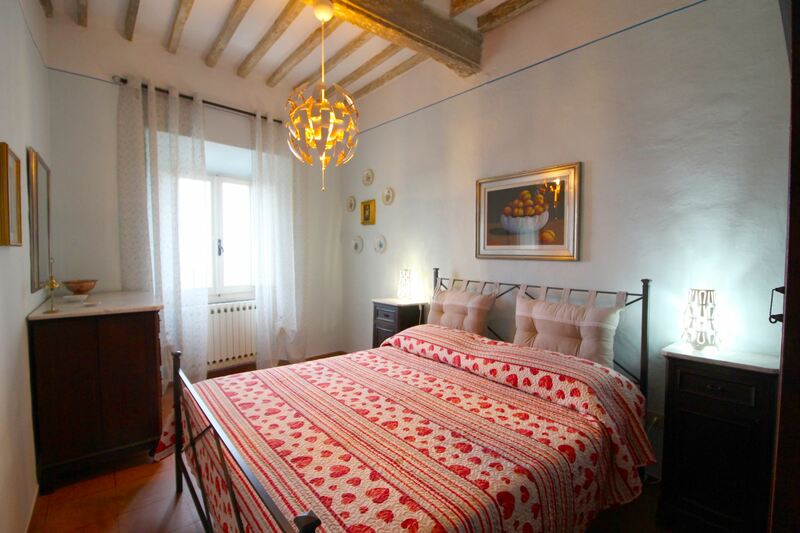 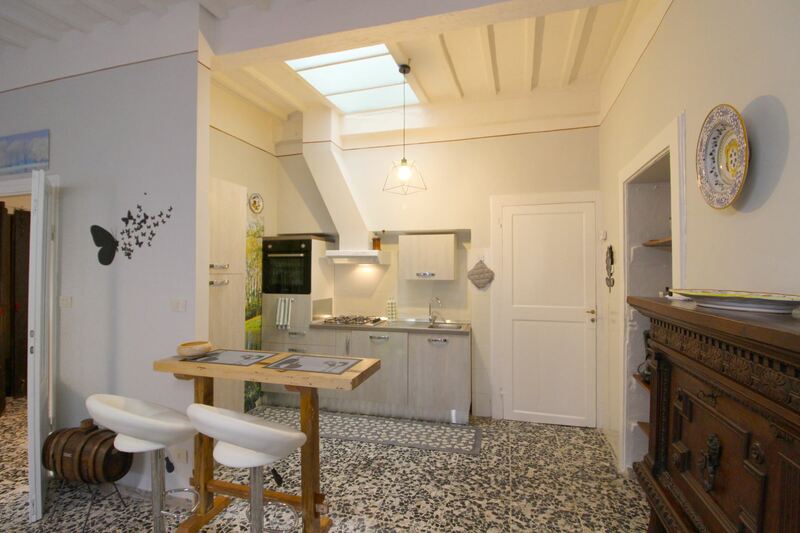 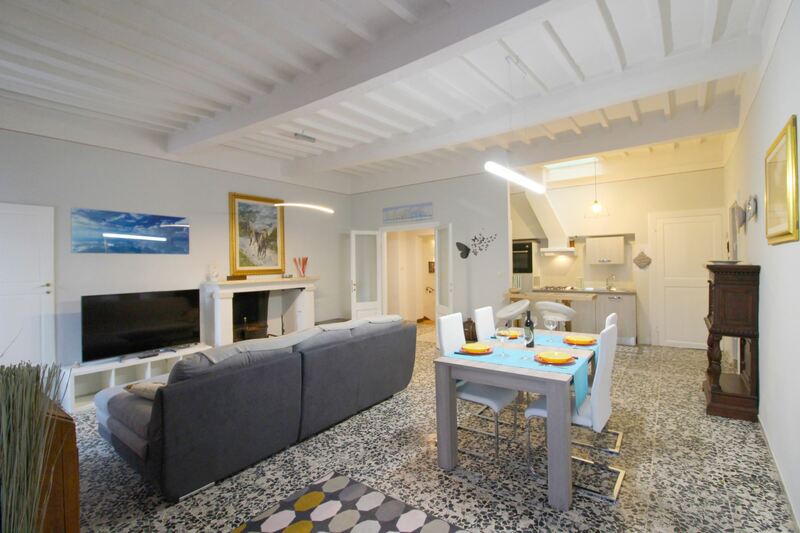 The apartment is furnished in a functional and tasteful way, and includes some local antiques. 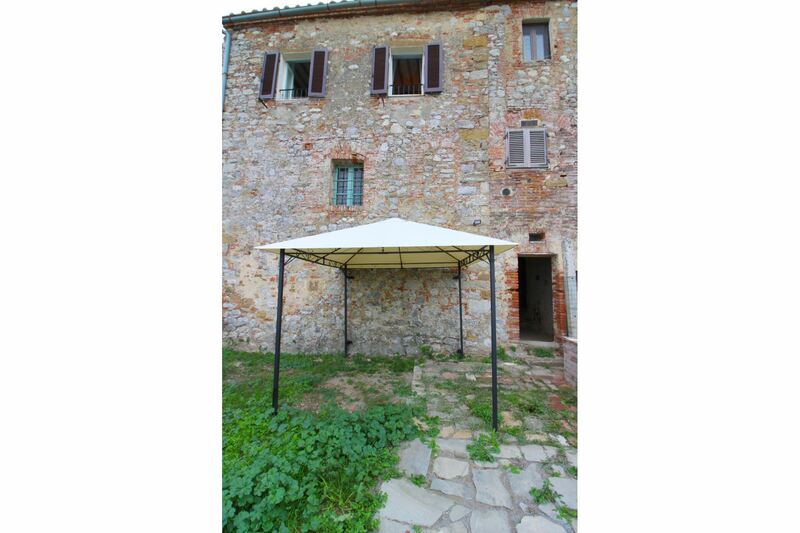 At clients disposal, besides the many facilities such as dishwasher, washing machine and Wi-Fi access, an evocative and panoramic garden, equipped with gazebo, outdoor furniture and barbecue. 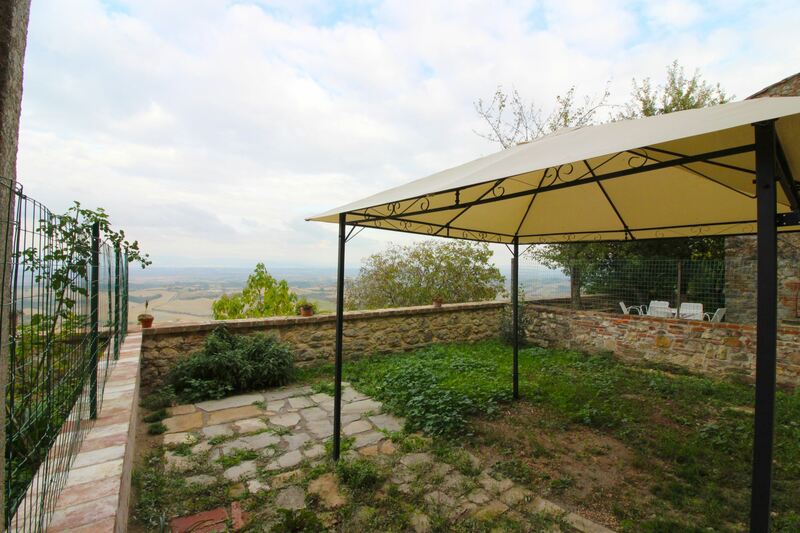 From the garden it will be nice to enjoy meals or relax, in front of an extraordinary view, which ranges from Cortona to Lake Trasimeno, from the green Valdichiana to the Valdorcia hills and to the Pratomagno massif. 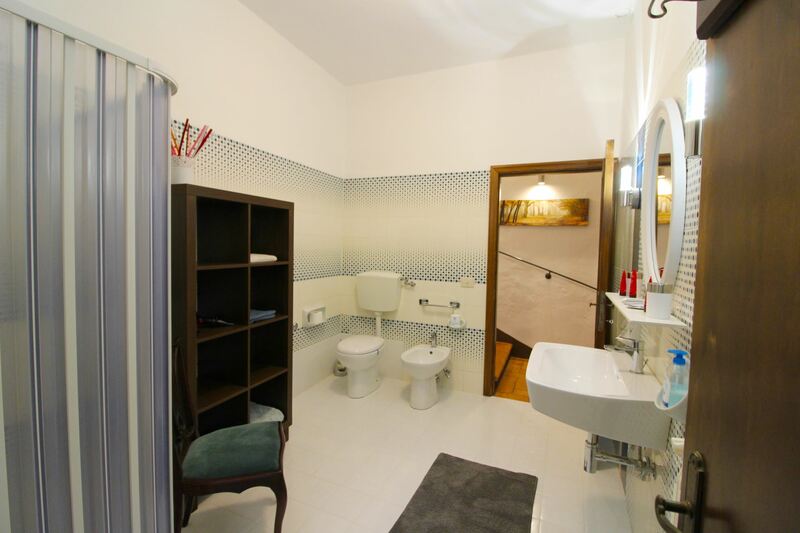 FIRST FLOOR: with access from internal staircase in common with two other apartments, entrance on a wide and bright living-dining room, with sofas, fireplace, TV and kitchen corner. 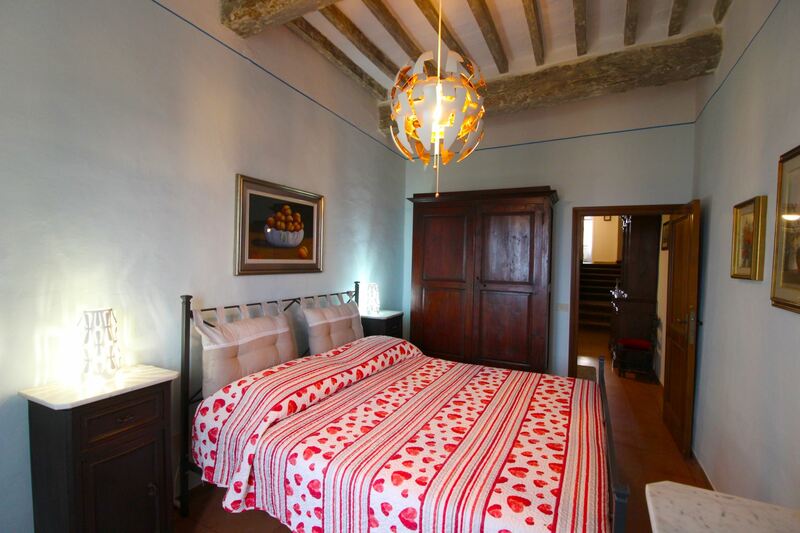 Going down a few steps leading to the sleeping area, we find is a bathroom with shower with closet with washing machine, a bedroom with French bed and two large double bedrooms with a very panoramic view from the windows. 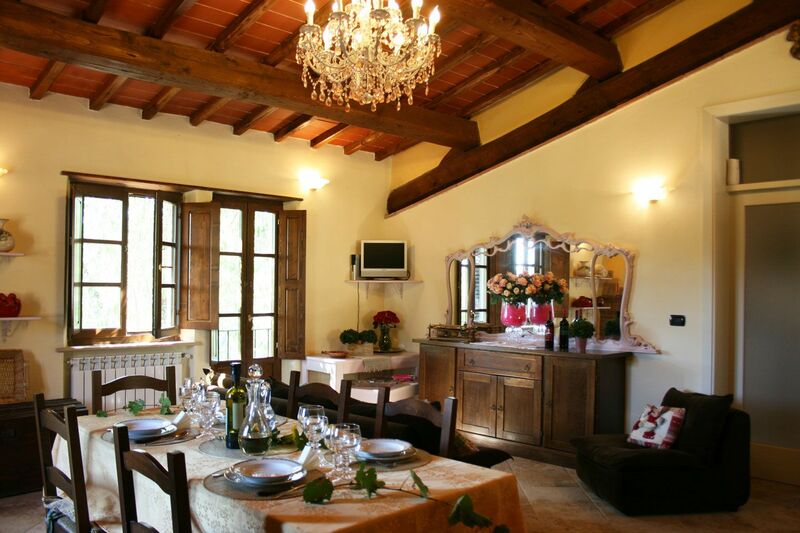 On ground floor, with access from the old stables, we reach a small garden located on a panoramic terrace with a wonderful view on Valdorcia and Valdichiana, to the Lake Trasimeno and equipped with gazebo, table, chairs and barbecue. 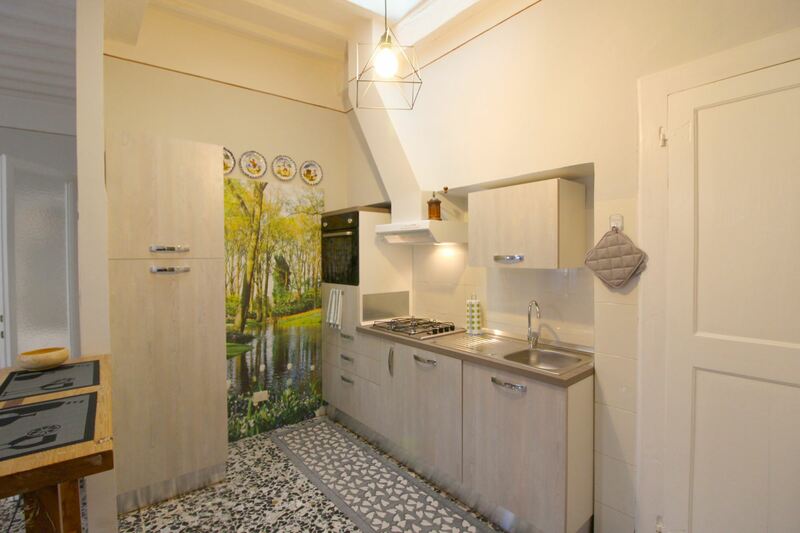 EQUIPMENT: fridge with freezer compartment, oven, dishwasher, moka coffee maker, filter coffee maker, washing machine, iron and ironing board, Wi-Fi Internet access, TV, hairdryer, barbecue. 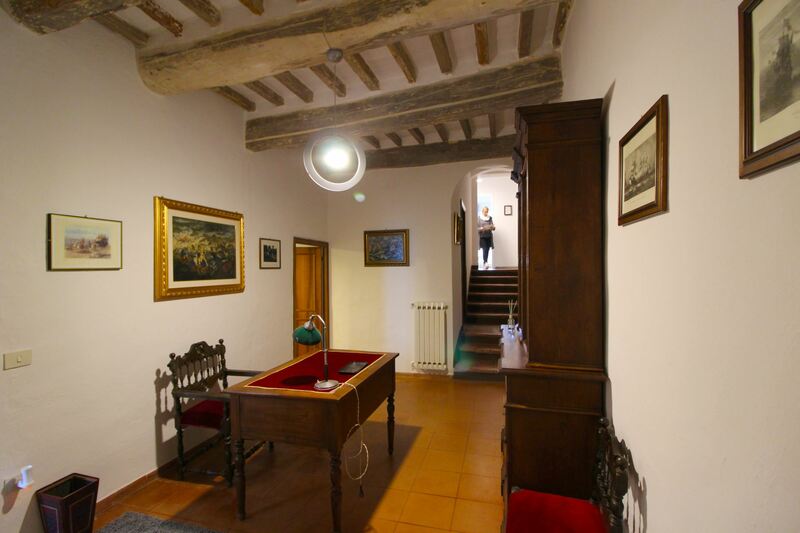 Breakage deposit Euro 100 (payable in cash on your arrival and held by the owner for the duration of your stay).